As general family dentists, Dr. James Feigenbaum and Dr. Jenna Feigenbaum are committed to healthy smiles. Healthy smiles need regular care from a dentist who offers a full range of general family dentistry treatments, and that’s exactly what you’ll find at our Creve Coeur dental office. With his gentle, caring touch and meticulous attention to detail, our dentists provide care for every age – you’ll find that you’re not sacrificing convenience to seek the great results you’ll get from Feigenbaum Dental. The American Dental Association recommends that you visit the dentist every six months for a general dentistry exam and professional hygiene visit. Our dentists will look for gum disease, cavities, oral cancer, and teeth grinding, amongst other possible problems. Our general family dentistry care can include fluoride treatments to make your smile stronger and less susceptible to decay. And we can provide dental exams and hygiene for children, too, making ours a truly family dental practice for Creve Coeur, MO. 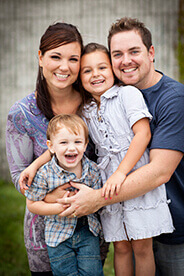 What dental care services does our general family dentistry practice provide? During your routine dental exam, our team’s goal is to create a full understanding of your unique smile and its needs. During a visual evaluation, we’ll closely inspect the surfaces of each tooth, the gums, the bite, any existing restorations, and other important areas. Digital X-rays will show us everything that isn’t accessible to the naked eye and allow us to accurately diagnose concerning issues like periodontal disease, oral cancer, teeth grinding, and more. Once we have all of this information at our disposal, our doctors can make recommendations for treatment. We welcome patients of all ages! Plaque is a sticky, film-like substance filled with bacteria that forms over your teeth, causing decay and damage over time. While regular brushing and flossing can typically get rid of it, areas that are missed can develop into a harder substance known as tartar. Here at Feigenbaum Dental, our team strongly recommends attending hygiene appointments every six months so that our talented team members can thoroughly remove plaque and tartar, leaving your smile feeling refreshed. Did you know that over 75% of the American population suffers from a mild to advanced stage of periodontal disease? In fact, a significant portion of that portion may not be even aware of its presence. While symptoms for the condition are relatively benign in the beginning, untreated cases can quickly progress, leading to tooth loss, jawbone deterioration, and other destructive consequences. Here in Creve Coeur, our team offers multiple periodontal therapy options, including scaling and root planing and advanced soft tissue laser treatment. When it comes to treating little smiles, our team understands that your child needs a special touch. That’s why our team is always as friendly and gentle as possible; we want to help them get on the right path towards lifelong oral health right away. Check-ups, cleanings, dental sealants, fluoride treatment, athletic mouthguards, and other children’s dentistry services are available! As general family dentists, we are interested in protecting your smile from damage, and teeth grinding and clenching can cause serious damage to your smile. The rubbing of teeth against each other will wear away tooth enamel and loosen the teeth at the roots, while clenching can actually break teeth when the pressure gets to be too much. General family dentistry treatments at our Creve Coeur dental office include nightguards for bruxism, which is the professional term for the habit of teeth grinding and clenching. By sleeping in a custom nightguard created just for you, you can prevent damage and lessen the pressure on your smile. Another form of protection offered by general family dentistry is the custom athletic mouthguard. If you or your child are very active in sports, weight lifting, or even leisurely physical activity like rollerblading, you’ll want to be fit for a custom athletic mouthguard from our dentists. These custom athletic mouthguards greatly reduce your risk of serious injury from sporting accidents, which are a common cause of all kinds of smile damage. Don’t let your active lifestyle do permanent and lasting damage to your smile – visit our Creve Coeur general family dentistry office for a custom athletic mouthguard. If you snore loudly every night, you might think this is a harmless, annoying, habit, but many snorers are suffering from sleep apnea. Sleep apnea is the cessation of breathing for ten or more seconds at a time throughout the night. Obstructive sleep apnea is the most common type of sleep apnea, and the blockage of the airway that leads to sleep apnea also causes loud snoring. If you or a loved one suffers from sleep apnea, we may be able to provide you a comfortable and effective treatment option– oral appliance therapy. By wearing an oral appliance during sleep, the airway is kept open and patients sleep soundly through the night. Digital X-rays have revolutionized dental care, becoming the technological standard of care in dental offices across the country. Our Creve Coeur dental office uses digital X-rays to provide patients with more complete care. Instead of printing the images of your teeth on X-ray paper, the images appear almost instantly on a chairside monitor, making the process faster and less wasteful. These images can be digitally stored for future reference. And they emit far less radiation, protecting your health as well as your smile. Using a soft-tissue laser, our dentists can safely, comfortably, and effectively treat gum disease and correct other gum problems at Feigenbaum Dental in Creve Coeur. We can treat canker sores, perform cosmetic gum procedures, and remove diseased soft tissue with our dental laser. Lasers have dramatically improved dental care in a number of ways, increasing sterilization and reducing pain, bleeding, and healing time. Nitrous oxide, or “laughing gas,” is a quick, easy way to reduce dental anxiety and increase comfort. You simply inhale the nitrous oxide gas, and you begin to feel a sense of warmth and euphoria. The effects wear off quickly enough that you can drive yourself home at the end of the appointment, and you have a good deal of control over the level of sedation you feel during your treatment. Oral cancer is a serious health issue, and the success of your treatment greatly relies on early detection. While smokers continue to be the most common sufferers of oral cancer, its incidence is growing in other groups as well, and we can use Velscope oral cancer screenings to look for the signs of this often unseen killer. With early detection technology like Velscope, we can find oral cancer when the signs are still mostly invisible. Learn more about our general family dentistry services by exploring the rest of the site. If you have any questions, please don’t hesitate to contact us. Feigenbaum Dental offers general family dentistry excellence for patients from Creve Coeur, MO. Conveniently located in the Creve Coeur area, we're close to the Maryland Heights and Town and Country neighborhoods. Our office offers 24-hour access to emergency dental care services. Contact us for an appointment!